In a previous post we showed a bunch of Lao cultural books. In particular cultural dtumla (rule) books in Laos are common. These are books that provide instruction, rules and understanding as to what to do (or what is believed to be needed to be done) to ensure it's good luck and/or according to Lao customs for practically almost every occassion in life. It's important to retain cultural customs. However admittedly, there are times when all the rules can be a bit much - even for us! There's instructions for even mundane events. 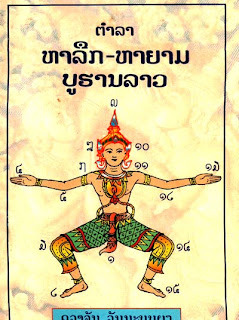 Some of these books include items that seem more superstitious in nature while others lean more towards commonly practiced Lao customs and beliefs and others towards more religious customs. What's more interesting however are the sources for these rules. Trying to determine where they come from or who wrote them or why it's important to believe in them is really a challenge to find out. As it turns out, as it was in the case of this book, many were sourced from old bylan (palm leaf, sometimes spelled as bailan) manuscripts/documents in Laos - some dating back centuries even. These types of books are an interesting read. The one shown here today is one such book written by a Lao author with information sourced and researched from bylan documents. Do you think you'd follow all the rules, religious, cultural, superstitious? For cultural research, it's worth picking up a few copies of these types of books. Hello where did you get this book and can you get more? I am very interested in getting copies of a few books that you show on your blog. Sabaidee, thank you for your interest. The dtumla books that we bought we were all purchased in Laos. Unfortunately, they're not widely available outside of Laos. If we find a source that you could easily order from, we'll be sure to mention it! I have a friend who was from Laos and her husband is dying. Is there anything I can do or give to her to show her compassion during this time? This is a great question. And a very thoughtful one at that. To answer your question, Lao people usually give food. The idea is that because the person is dealing with a sick or dying loved one that they will have one less thing around the house to have to do. Also during this time, they often receive other visitors who come to pay their respects to the person who is sick/dying. As such, the host will then offer food and drink to the many visitors. So this act helps the host tremendously.